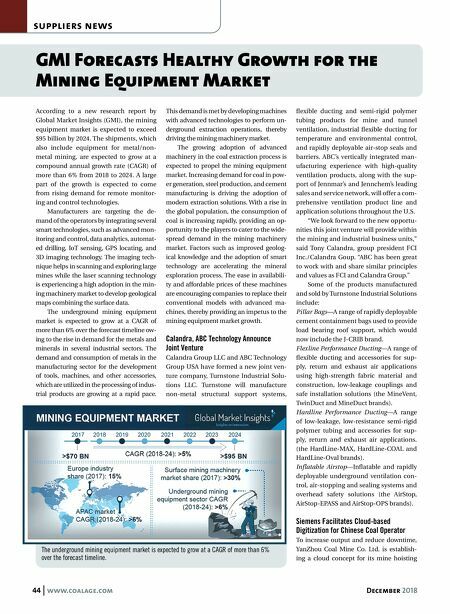 44 www.coalage.com December 2018 suppliers news GMI Forecasts Healthy Growth for the Mining Equipment Market According to a new research report by Global Market Insights (GMI), the mining equipment market is expected to exceed $95 billion by 2024. 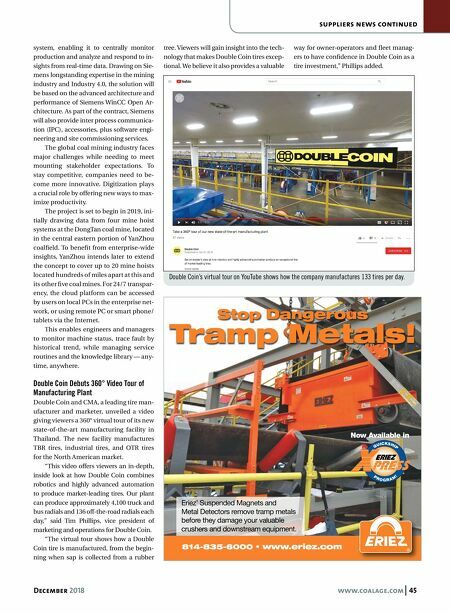 The shipments, which also include equipment for metal/non- metal mining, are expected to grow at a compound annual growth rate (CAGR) of more than 6% from 2018 to 2024. A large part of the growth is expected to come from rising demand for remote monitor- ing and control technologies. Manufacturers are targeting the de- mand of the operators by integrating several smart technologies, such as advanced mon- itoring and control, data analytics, automat- ed drilling, IoT sensing, GPS locating, and 3D imaging technology. The imaging tech- nique helps in scanning and exploring large mines while the laser scanning technology is experiencing a high adoption in the min- ing machinery market to develop geological maps combining the surface data. The underground mining equipment market is expected to grow at a CAGR of more than 6% over the forecast timeline ow- ing to the rise in demand for the metals and minerals in several industrial sectors. The demand and consumption of metals in the manufacturing sector for the development of tools, machines, and other accessories, which are utilized in the processing of indus- trial products are growing at a rapid pace. This demand is met by developing machines with advanced technologies to perform un- derground extraction operations, thereby driving the mining machinery market. The growing adoption of advanced machinery in the coal extraction process is expected to propel the mining equipment market. Increasing demand for coal in pow- er generation, steel production, and cement manufacturing is driving the adoption of modern extraction solutions. With a rise in the global population, the consumption of coal is increasing rapidly, providing an op- portunity to the players to cater to the wide- spread demand in the mining machinery market. Factors such as improved geolog- ical knowledge and the adoption of smart technology are accelerating the mineral exploration process. The ease in availabili- ty and affordable prices of these machines are encouraging companies to replace their conventional models with advanced ma- chines, thereby providing an impetus to the mining equipment market growth. Calandra, ABC Technology Announce Joint Venture Calandra Group LLC and ABC Technology Group USA have formed a new joint ven- ture company, Turnstone Industrial Solu- tions LLC. Turnstone will manufacture non-metal structural support systems, flexible ducting and semi-rigid polymer tubing products for mine and tunnel ventilation, industrial flexible ducting for temperature and environmental control, and rapidly deployable air-stop seals and barriers. ABC's vertically integrated man- ufacturing experience with high-quality ventilation products, along with the sup- port of Jennmar's and Jennchem's leading sales and service network, will offer a com- prehensive ventilation product line and application solutions throughout the U.S. "We look forward to the new opportu- nities this joint venture will provide within the mining and industrial business units," said Tony Calandra, group president FCI Inc./Calandra Goup. "ABC has been great to work with and share similar principles and values as FCI and Calandra Group." Some of the products manufactured and sold by Turnstone Industrial Solutions include: Pillar Bags—A range of rapidly deployable cement containment bags used to provide load bearing roof support, which would now include the J-CRIB brand. Flexline Performance Ducting—A range of flexible ducting and accessories for sup- ply, return and exhaust air applications using high-strength fabric material and construction, low-leakage couplings and safe installation solutions (the MineVent, TwinDuct and MineDuct brands). Hardline Performance Ducting—A range of low-leakage, low-resistance semi-rigid polymer tubing and accessories for sup- ply, return and exhaust air applications. (the HardLine-MAX, HardLine-COAL and HardLine-Oval brands). Inflatable Airstop—Inflatable and rapidly deployable underground ventilation con- trol, air-stopping and sealing systems and overhead safety solutions (the AirStop, AirStop-EPASS and AirStop-OPS brands). Siemens Facilitates Cloud-based Digitization for Chinese Coal Operator To increase output and reduce downtime, YanZhou Coal Mine Co. Ltd. is establish- ing a cloud concept for its mine hoisting The underground mining equipment market is expected to grow at a CAGR of more than 6% over the forecast timeline.